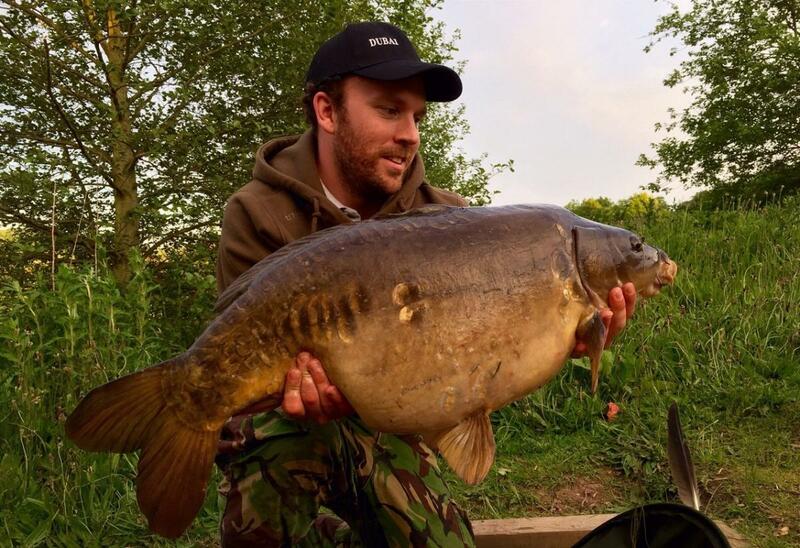 With the long awaited summer weather finally upon us, June’s competition, sponsored by Viking Baits and Red Eye baits, has produced some tremendous specimens from club waters. 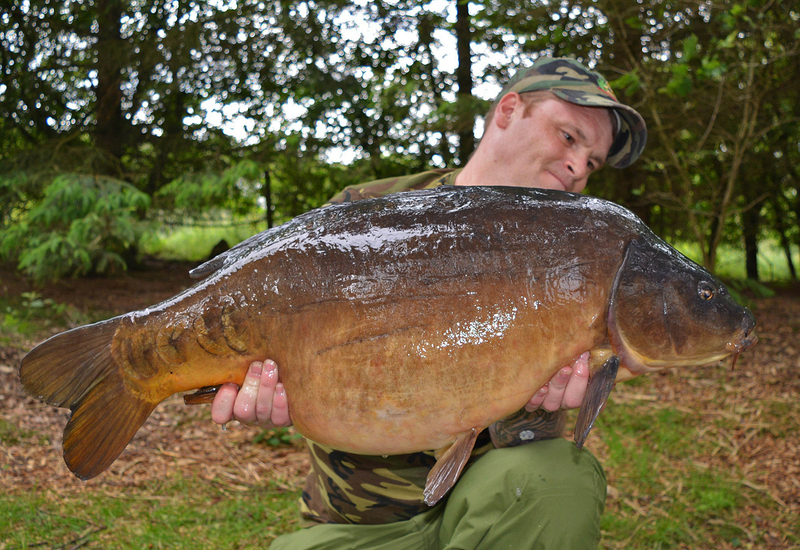 The best of the bunch include a stunning PB mirror for club member Coxy12, from Wrinehill pool. 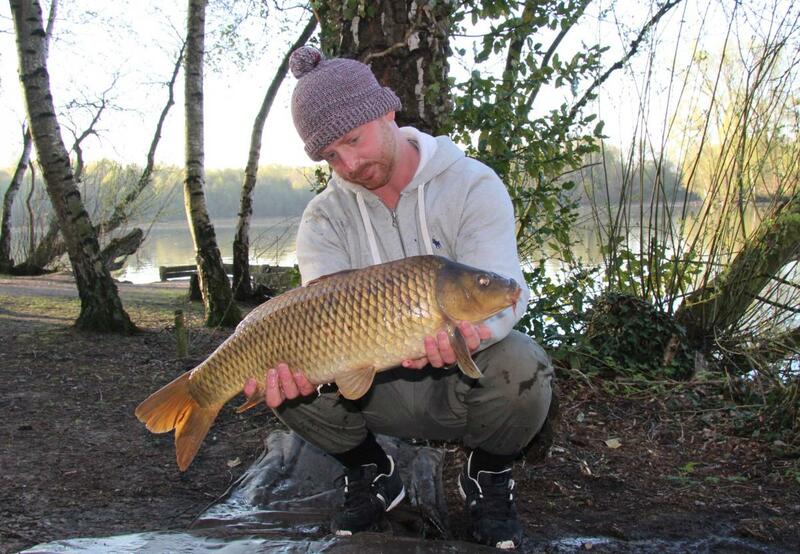 Forum member Gazzab123 had a great session on Serpentine pool, on the Belmont estate. 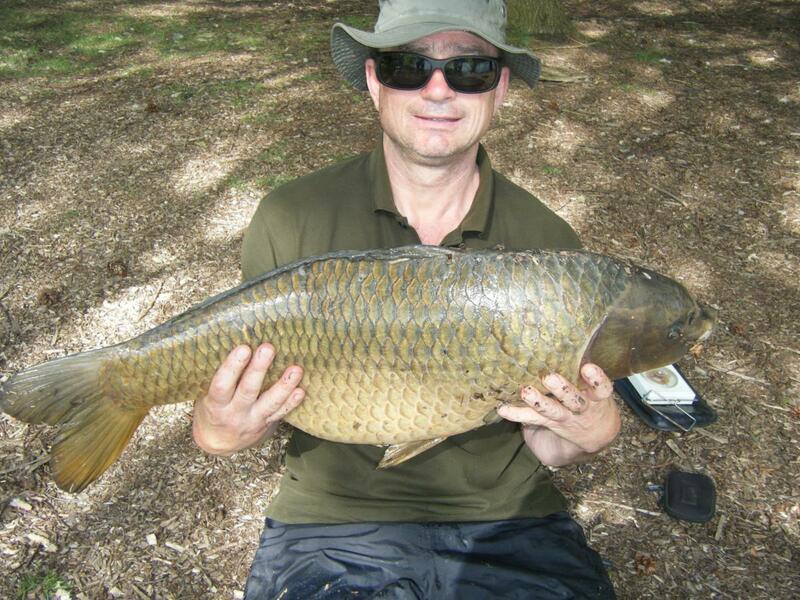 The best of five carp was a PB 20.2lb common. ‘This one is bound to win. Finally caught a 20+ fish after not really trying to catch one for the last 40 odd years. 6lb line with a small ball of boiled paste meant for proper fish. 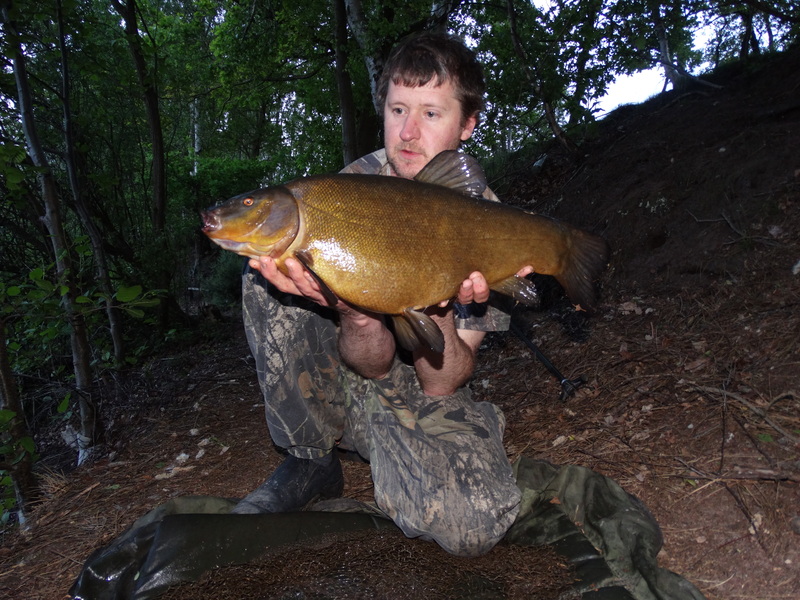 (tench) 25lb and a few ounces. And because I’m the first to catch it, I’m giving it a name. It’s name is a carp. From the Vale’. Billy’s first 20lb carp, from Lymmvale. To complete the list of competitors, this is an 8.12lb tench, which Billy was hoping to catch, also from Lymmvale. Firstly, a big apology to all members who had hoped to get on Chester’s Specimen lake on the 1st day of the season. Like most of us, the carp on Chester only spawn once a year so I had to give them their privacy and close the Lake. Thank you to all the lads who where on there and left without any complaints, it is really appreciated. Anyway, as Chester was closed I joined the minority and planned an alternative lake for the first weekend of the season. After much deliberation I chose Lymm Vale. I even managed to get the Friday afternoon off work in the hope of beating the Friday rush to the lake. I rocked up just after 2pm and bumped into one of my regulars from Chester. He’d already spotted the fish so swim selection wasn’t difficult and I set up on the Boat House. I expected the Vale to be busy as a few lakes where closed for spawning. I checked my watch at 5pm and was quite shocked that there were still plenty of pegs free. As such, I called my mate Nick and told him to come down to wet a line. Nick had planned to join Lymm Anglers for a while and wanted to fish Chester on the 1st day of the season. However, as I’d closed it for a few days Nick was going to wait till it was open again before arranging his membership. I explained to Nick that he could join online and as long as he could provide proof to the bailiffs he’d be fine. Nick arrived just after 7pm some 20 minutes after paying for his ticket. Regrettably, a few more people had turned up so the peg next to me was now taken. However, when Nick arrived we had a look round the lake and thought his best chance would be at the car park end of the lake. Once Nick was set up I went round the lake to check tickets and to see how everyone was getting on. It transpired that the lads on the sand bank where leaving early in the morning and the lads next to me where swapping swims with them. This in return, would leave the two pegs on my left empty. That evening I had a few Tench and the lad next to me landed a stunning Mirror. The next morning around 5am the heavens opened so this delayed the peg move slightly however I managed to move and Nick joined me after the rain had settled. I explained to Nick that I’d had a cast around in both swims (while he was tucked up in his bivvy out of the rain) and found a few spots of interest. We were on the same bait so agreed to fish as a pair and maximise our chances by covering a reasonable area of the Lake. It was a quiet afternoon with all the fish moving away from us and up towards the car park end (much to Nick’s frustration). I explained to Nick that the reason for this was clearly because John Stubbs had the kettle on and was making bacon butties. In fact it wasn’t just the carp that ended up that end of the lake. I also found myself up there choosing between red and brown sauce. Now, I think this was the pivotal moment in mine and Nick’s session. Reason being, I told Nick that I was just going to see John for a catch up. However, I managed to devour two bacon butties (I chose brown sauce by the way) and two cups of coffee. When I got back to the peg Nick, like any good fishing partner, was also in chef mode and had the bacon on the go. Regrettably, I had to decline the offer of a third bacon sandwich and made the excuse that I was changing some rigs round and I’d have one later. I really didn’t have the heart then to tell him I’d already had breakfast and I think this is when the carp gods looked down on me in disgust! I attempted to hide my guilt by regularly making a cuppa but what happened next made it clear there was not getting away from my little secret and this reminded me that angling always finds a way to even things out. We had just started to get some bait out when Nick’s right hand rod roared (and I mean roared) off with a one toner. This rod was only an under arm chuck away and I clocked the swirl from my peg. By the time I got over to Nick his was rod tip was no higher than his shoulders with the rod almost straight. As you can imagine, my first instinct was to ask ‘what you playing at noddy’ but it soon became apparent he was struggling to get the rod any higher. I helped him sort his clutch out and from then onwards it was all down to him. Nick had never caught a cat before and it was one species he was keen on avoiding. In fact I remember the time when the roles were reversed and once he netted it for me he was off! The first time the cat came in close we knew it was the big girl and Nick looked far from impressed, but he soon zoned out again as it ripped of another 30 yards of line. The battle was epic and an experience that Nick will never forget. It was easily 20 plus minutes and we have most of it on film. All the commotion had alerted Jordan and Chris from the sand bank so they reeled in and came over. A huge thank you lads for your assistance as I don’t think we’d of managed without you. Chris and I secured the massive predator in the sling while Jordan held the scales. Meanwhile Nick didn’t know what to do with himself and who could blame him. He’d been a member just over 24hours and landed the biggest fish on the Lymm card. 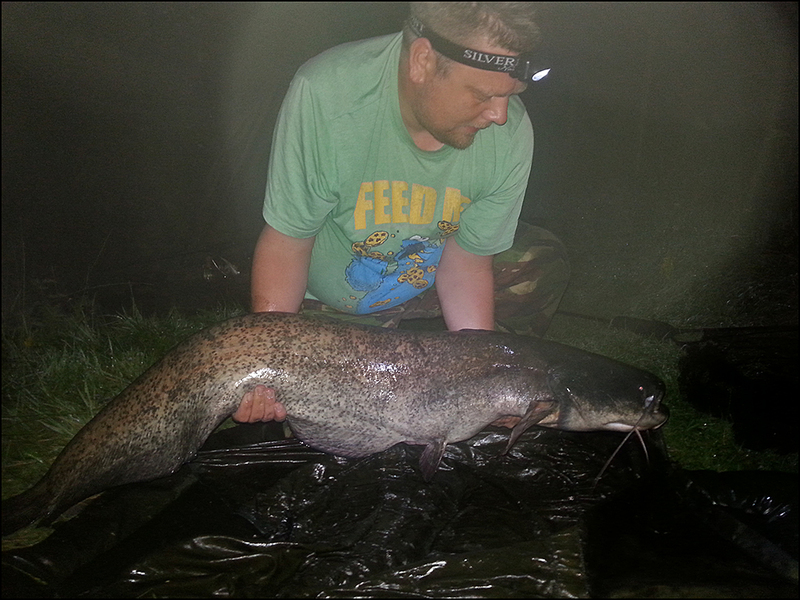 The cat weighted in at 66lb 5oz a represents a new Lymm Vale lake record. Naturally I’ve told him it doesn’t count because we were after the carp, which technically means he blanked! Joking aside, top angling Nick you deserved that buddy. A worthy winner I’m sure you’ll agree and thanks to Neil for a great write up. To fish Lymmvale for the big cats and of course all our other waters too, check out the website by clicking on the link below! 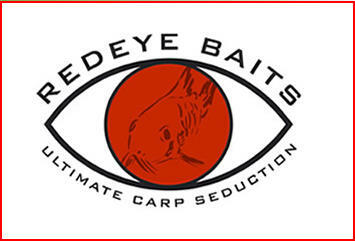 May’s competition sponsored by Viking Baits and Red Eye Baits, was an easy decision for our judges. 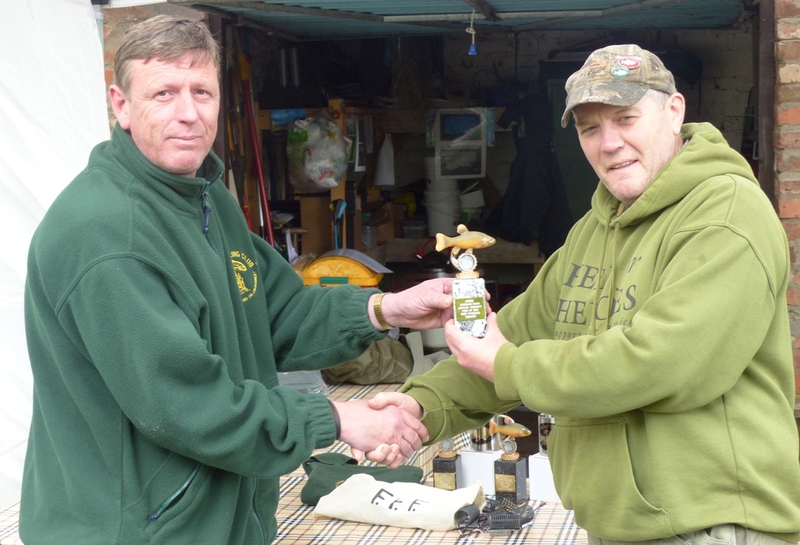 Huffy’s session on Lymmvale for the Macmillan charity tench fish-in was the clear winner. There were some impressive runners up though, with the pick of the bunch being a Bridgewater canal ‘twenty’ from Mike at Viking Baits. But Malc’s memorable session won and he’s put together a great write up for the blog. This is a date I always look forward to on my angling calendar, this year it was to raise money for Macmillan Cancer Support, a very worthy cause indeed. The banter and camaraderie on these fish-ins is second to none. When drawing for pegs I decided that ANY peg on the west bank would do me, the sole reason being that I did not want to spend the next 48 hours with the wind blowing in my kipper. (I like to fish in luxury and comfort in my old age). Luckily a west bank swim was available by the time my number came around and off I went. Both rods were baited and cast towards the Sandbank swim, plan of attack was the right hand rod on maggot feeder/fake caster and left hand rod was method feeder and Viking Baits crab and plum 10mm boilies. About 25 mins in, the right hand rod was away and after a cracking battle a PB female Tench of 7lb 2oz lay in the net. Many thanks to Phil Hatton for the pictures. About 40 mins later the right hand was away, which turned out to be a male tench of 6lb 2 quickly followed by two more small male tench to the method rod At this point it made sense to change the maggot feeder rod over to a method feeder and fish this one with a small tutti frutti dumbbell. The plan was working a treat as three more tench followed during the Saturday morning. The action slowed during the afternoon and we took a break for a barbeque. After a scoff it was with renewed vigour that I went back to my swim keeping to the plan of both rods on method feeders as it had worked from the off on the Friday evening. About 45mins after casting both rods to the spots the right hand rod burst into life…..RIGHT….Now is the time to put my hands up and confess that the next 10-15 maybe more mins I fished like a complete Wally!! (As the spectators on the opposite bank will no doubt testify) what initially felt like a decent tench at first, started to bully ME! Taking on stronger runs and hugging bottom, this aint no tench I thought after it went on a searing run for freedom, it has to be a carp. Off it went crossing over my left hand rod, trying to gain line on the fish I managed to get the rod tip caught in the trees overhead, muttering profanities and trying to stay calm I somehow managed to free it only for the fish to kite over my rod to the right in a bid to reach Stubbsy’s hut! After what seemed like an eternity I finally managed to net her. Bruce had come over to see what I had caught and by this point my legs really had turned to jelly. Prepping the mat, sling, scales and camera we both lifted her gently onto the mat. 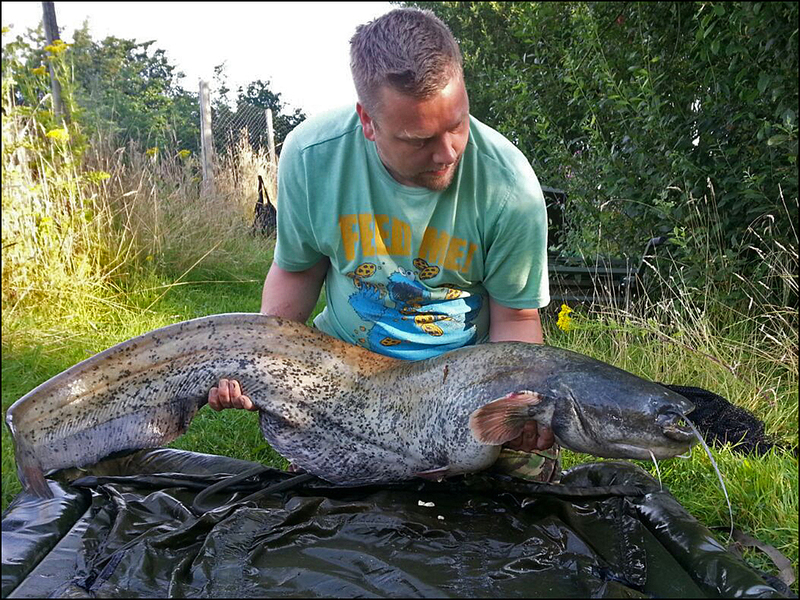 We had several attempts to weigh her with a steady hand and it was agreed upon that it was 29lb 14oz. 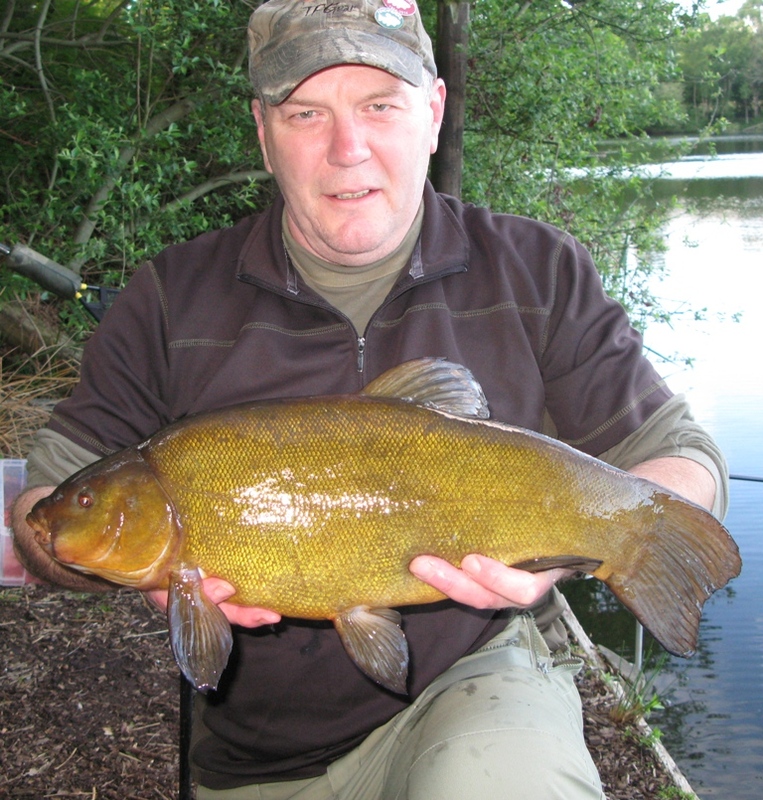 I even managed another two tench that evening, one of the being another PB male tench of exactly 7lb. A red letter day I will fondly remember. Well done Malc! A great session and a great write up. June’s competition will have to be special to top that, you can enter via the members forum or on the club’s Facebook page. If you’re interested in joining Lymm AC, click on the link below to visit our website. Welcome to Lymm Angling Club’s catch of the month competition for April. With the weather improving and the temperatures on the rise, April saw some cracking fish entered into the competition. Some good sized carp from Serpentine pool on the Belmont complex and a big catfish from Spring Pool were the runners up. 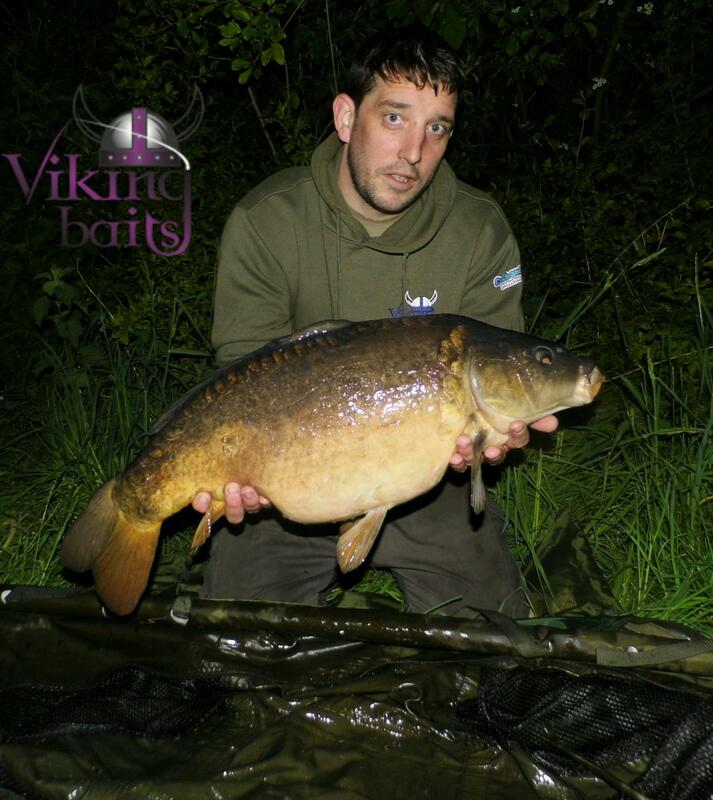 But our sponsors Viking Baits and Red Eye Baits chose Al Green’s session on Shakerley Mere as the winner. Al provided us with this great report.. Finally I managed to get some decent bank time this year, the weather was awesome and with only one other angler on the lake the fish were in front of my chosen swim. Happy days I thought, I got some bait out and got the rods out onto two of the firmer patches only to be awoken after less than an hour with a Canadian goose flying into the marginal tree line with my rig attached. Not a great start but after a couple of hours of coaxing and feeding and with the help of two ladies we managed to cover goose to calm her and free the rig that was tangled round her leg. Panic over! I got the rods back out only to have a another take within 10 minutes, this was one fish I felt I must deserve after the earlier dramas. After a short heavy slow scrap the hook pulled at distance and with that big teasing bowwave she was gone . Never mind… staying positive I got the rods back out and settled back down, with the weather warming up the fish were becoming a lot more active and were clearly all over my swim and at around 2pm the left hand rod was off. 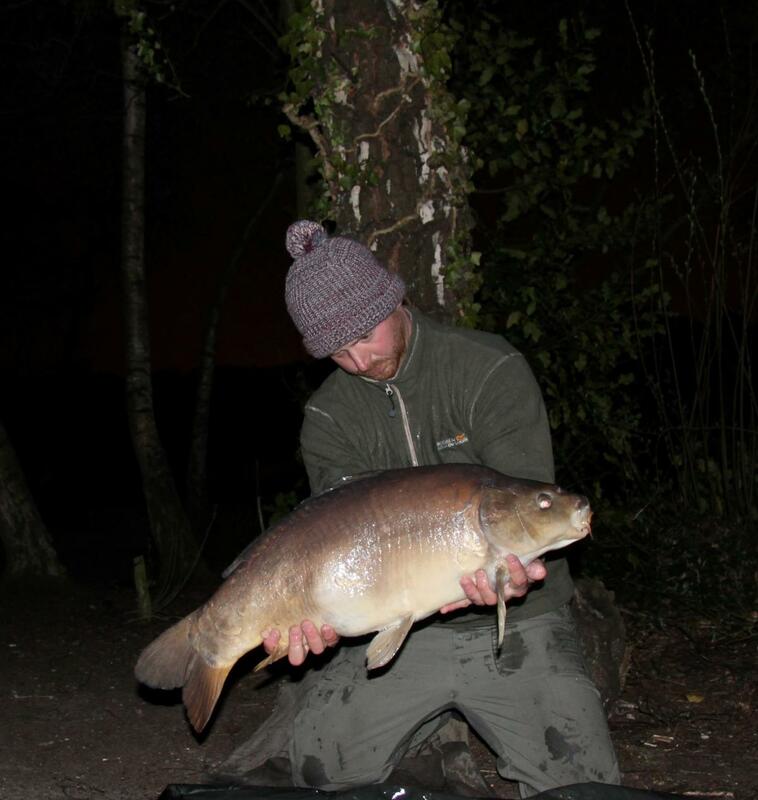 After a fairly dull fight the fish was in front of me a nice dark mirror, no monster but looked a lovely fish , net out ready to bring her over the cord when dink out popped the hook…. This was going t be one of those days! A few f’s n jeff’s and turning the air blue I got my rods back out had some lunch and got settled again. The rest of the day stayed quiet I chopped and changed tried a few zigs but nothing. So got my rods set back up for the evening and back out onto the spots. All was quiet until midnight when I had a take on the island rod that resulted in my first fish off the water for 2015 and broke the duck! Not the prettiest fish in the lake but definitely the most welcome and a 20 to boot a mirror that tipped the scales 21.02. Not much happened apart from the usual liners until the morning around 7 am when I had a screaming run and a typically hard fight from the one of smaller commons. A nice and pristine condition low double was the result. The rest of the day was fairly quiet with a dropped run around lunch time and another small 6lb common before packing up to round off an eventful trip. Went home a very happy man to have christened my new rods and broke the seal for this season. happy days and tight lines. If you would like to have a go for fish such as these, then take a look at our website, www.lymmanglersclub.com where you will find details of all our waters and, of course, joining information. The March 2015 Catch of the Month competition, with alternate monthly prizes provided by club sponsors, Viking Baits and Redeye Baits, saw a slow increase of reports submitted as the colder weather started to abate and more anglers got out on the banks. One such angler was Lymm member, Elliot Knox who paid a visit to Lymmvale hoping to bank one of its carp, he did, and in style! 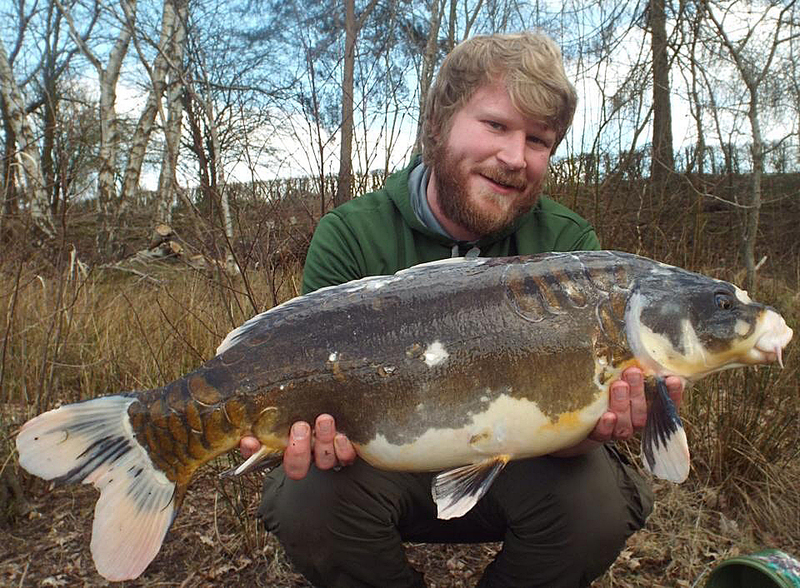 Elliot is our March COTM winner for his magnificent Koi carp capture, read his story below…. “When I arrived at the ‘Vale, I spotted a few fish in the upper layers and breaking the surface, this filled me full of hope. It was quite a pleasant, warm day and the water where the fish were showing was around 11’ deep. I decided on fishing zig-rigs and given the depth of water, it made sense to opt for an adjustable zig. The first cast went bang-on the spot. While I was then setting up my second rod, the first one let out a single bleep of the alarm. I’d arrived here having been made aware by people that the carp could be tricky at times, so I looked down in disbelief as the rod hooped over and the clutch started ticking! March COTM winner, Elliot Knox, proudly showing off his 22lb 2oz koi carp. Well done, Elliot on a superb capture. Should anyone wish to have a go for fish such as Elliots’, then take a look at our website, www.lymmanglersclub.com where you will find details of all our waters and, of course, joining information. We look forward to hearing from you! The November 2014 Catch of the Month competition, with alternate monthly prizes provided by club sponsors, Viking Baits and Redeye Baits, saw a ‘slowing down’ of reports submitted, not unusual for the time of year, but encouragingly, people are still out there looking for a bend in the rod! Graham Higham visited Micklewrights Flash for a piking session and it is his new personal best pike of 13lb 9oz, taken on a deadbait, that scoops Novembers prize – well done, Graham! Graham with his new pb pike! 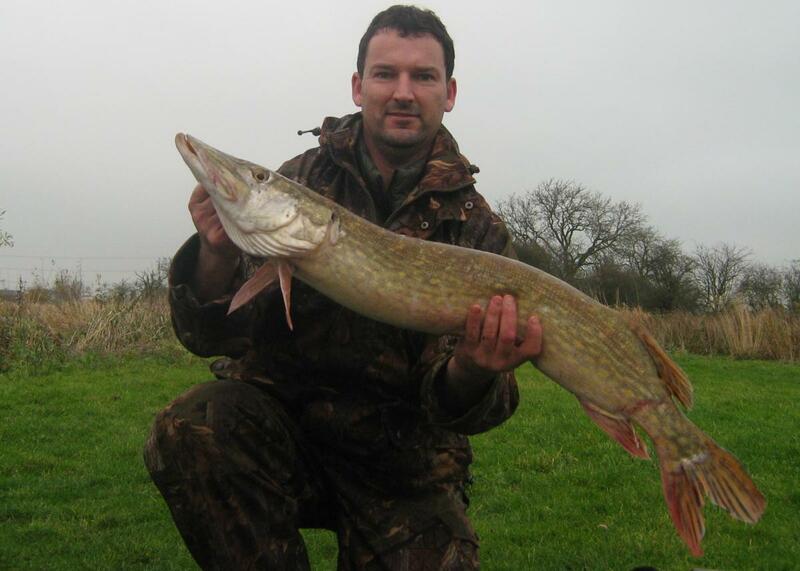 Had a catch worthy of entering our Catch of the Month competition? Simply send us the details by submitting a catch report form you can also enter by emailing us at pr@lymmanglersclub.com or simply adding the details to the COTM thread on the club forum. 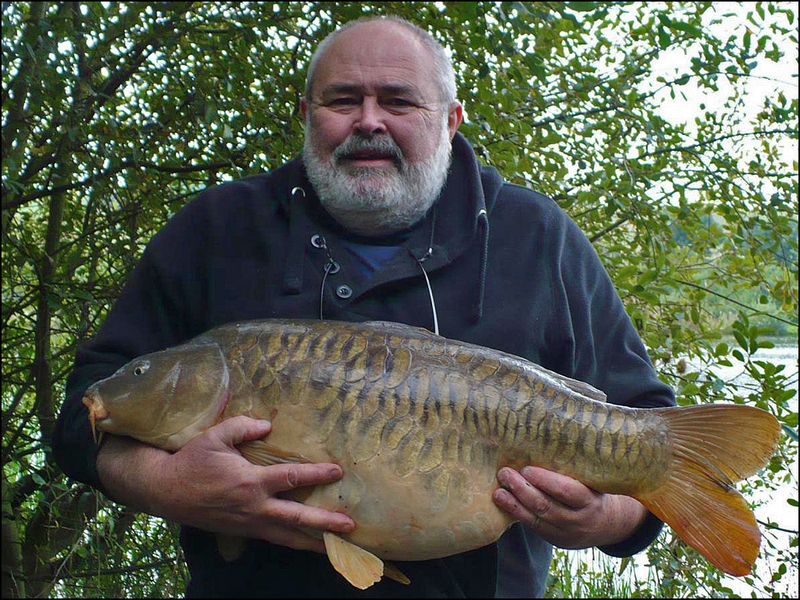 The September 2014 Catch of the Month competition, with alternate monthly prizes provided by club sponsors, Viking Baits and Redeye Baits, saw a month of good catch reports submitted. It was a difficult decision but one entry stood out from the rest……..
Shirley Bloxham took a visit to Belmont Pool arriving around about 11.30 with her husband and proceeded to fish about 1:30pm. Using her own home made bollies with just half a dozen free offerings she patiently waited and about 4 pm the rod screamed off and the result was a 27lb mirror followed about an hour later with a 19lb mirror. It just goes to show it doesn’t matter whether your female or a golden oldie you can still catch the big ones. Therefore it gives us great pleasure to announce Shirley Bloxham as the September winner of Catch of the Month and the Viking Baits prize, congratulations, Shirley on achieving a great result and on your own home made bollies. Shirley with her 27lb Carp Belmont pool September 2014. 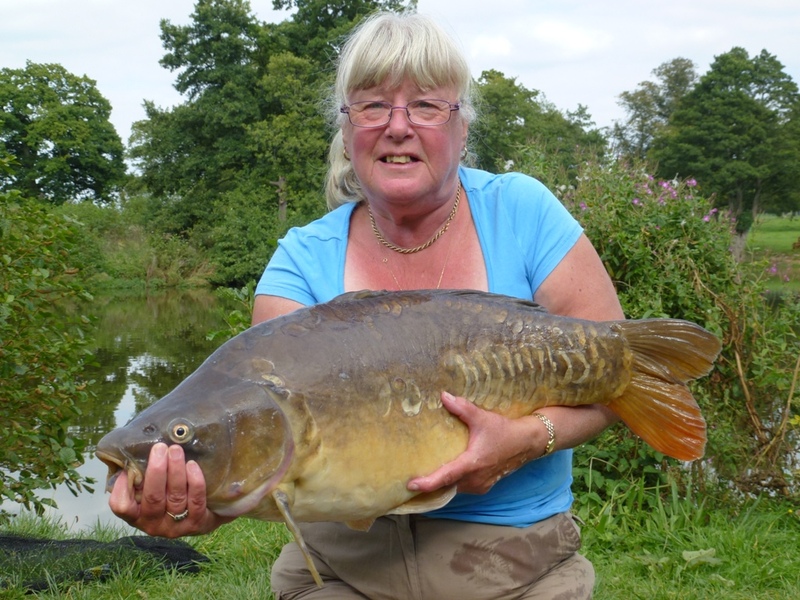 Shirley with her 19lb Carp Belmont pool September 2014. 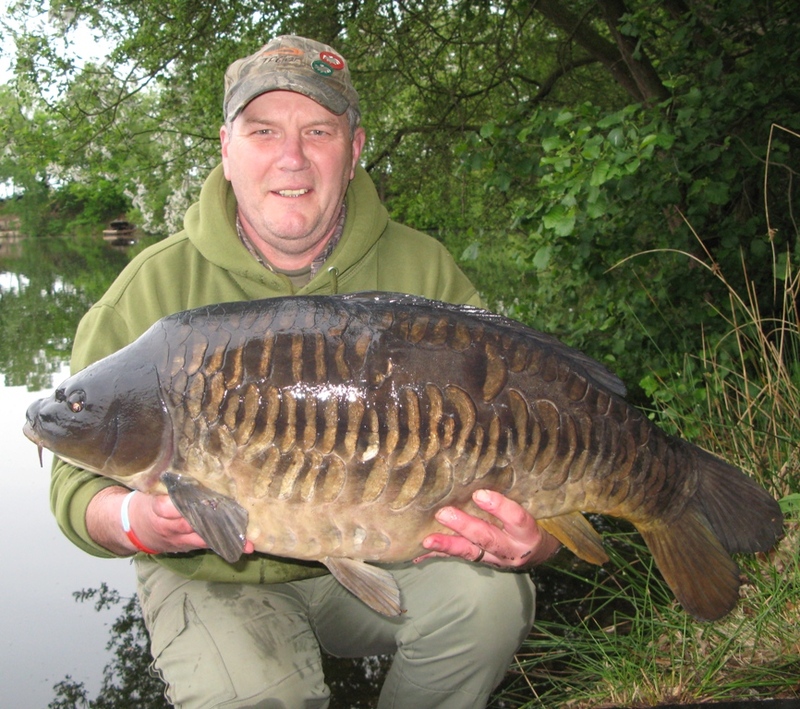 The August 2014 Catch of the Month competition, with alternate monthly prizes provided by club sponsors, Viking Baits and Redeye Baits, saw a month of limited catch reports submitted. However, despite the paucity of submissions, one catch report did stand out and that was ‘billysiv’s’ report of his 22lb 70z, fully scaled mirror carp from Wrinehill Pool. Billy has been angling for fifty-five years and this fish was his first ever ‘twenty’ and came on a session that ended a run of several ‘blanks’ at Wrinehill ! Therefore it gives us great pleasure to announce ‘billysiv’ as the August winner of Catch of the Month, congratulations, Billy on achieving a long sought target and one of those moments that stays in an anglers memory forever! Billy with his long awaited ‘twenty’! 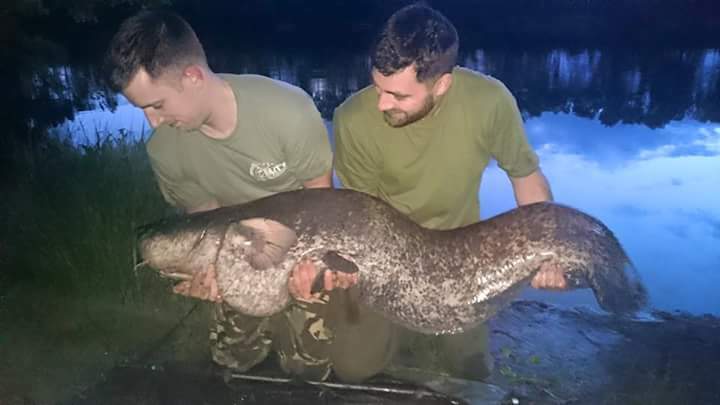 The July 2014 Catch of the Month competition, with alternate monthly prizes provided by club sponsors, Viking Baits and Redeye Baits, saw a month of catch reports dominated by accounts of big catfish captures. It is one such report that bags this months prize. Whilst there were reports of bigger fish, it’s the circumstances of this particular catch and the quality pictures that got the winning votes. 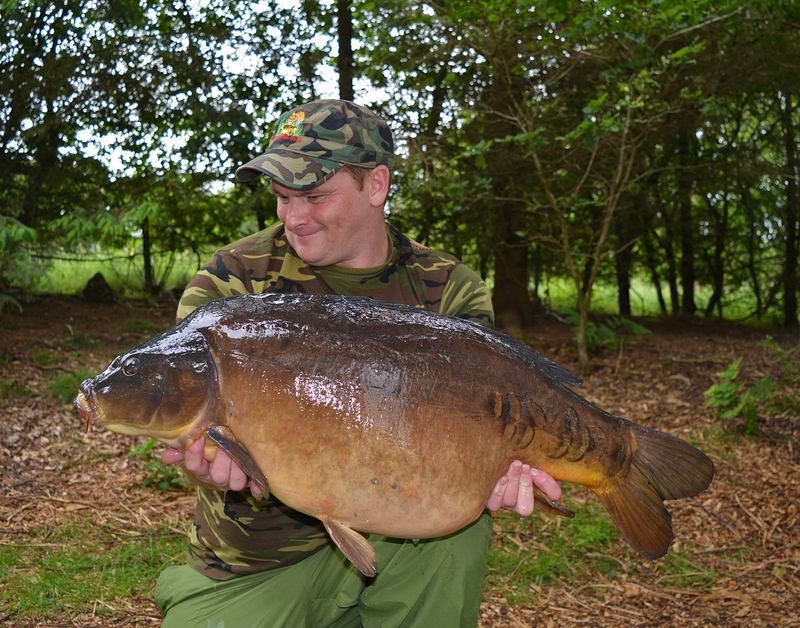 The winner for July 2014 is Darren ‘Daz’ Loseby for his brace of big Wels from Spring Pool on his first ever visit to the water for a session that was designed to up his PB – mission accomplished! The June 2014 Catch of the Month competition, with alternate monthly prizes provided by club sponsors, Viking Baits and Redeye Baits, again gave the judges a bit of a headache in choosing a winner! Not a massive amount of entries, but all top quality! However, this month’s winner was selected for the fish itself, a true Lymmvale beauty, the circumstances of the catch and the outstanding quality of the trophy shots. 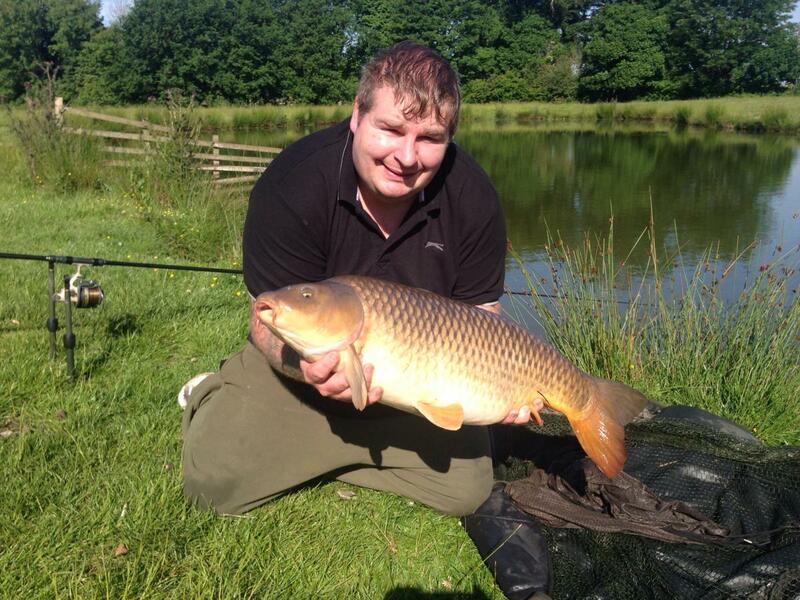 The June 2014 Catch of the Month prize goes to William Tabern for his Lymmvale 30lb 4oz mirror carp. William’s stunner of a mirror carp!